What do I call this car? At the Danish car sales website Bilbasen, it’s an FX35. If you ask about that model name, Wikipedia identify it is as an Infiniti QX70, on sale from 2013 to 2017 and it’s patently not that. Dialling up that name at Google brings up everything Infiniti has ever made, but mostly QXs of one sort of another. It is probably not insignificant that Infiniti’s determined inability to really break into the European market has resulted in semi-obscure models like this, with name changed mid-model or altered to suit various markets. So, clarity: despite the ad, it’s an EX35, sold from 2007 to 2013. In 2013 the EX cars were renamed QX, from one meaningless alphanumeric to another. I suppose this was sold as an EX in Denmark. In Japan it was a Nissan Skyline Crossover. Maybe it was sold as a Nissan Terryno in the UAE and as Nissan Off-Trail in Russia and Austria…. In contrast, a BMW 3 series is a 3 series wherever you go in space in and time – an automotive constant in a universe otherwise characterised by variation and unpredictability. They have secure models, nailed to firmament like the stars of Orion’s belt. Not so poor Infiniti, makers of quite nice cars since, well, thirty years ago (they started selling in 1989. I can see why Infiniti sold so few of the EX35: a 3.5 litre engine is excessive in Europe. Infiniti were not serious when selling this car here: it needs a 2.0 litre diesel. Oh, this is all over the place. We are no nearer understanding this car, are we. I can report that it took almost two hours to realise the car’s identity and wrote a load of text thinking it was a QX70 and wondering why the headlamps in the image search didn’t match the photos…. I was wondering recently about finding and listening to a Beatles album (I have never heard one) and giving it a spin. It dawned on me that in order to make sense of it I’d have to listen to all its predecessors in chronological order. Then I’d need to read some biographies to see what the fabulous four were listening to at the time each album was made. And then I’d need to investigate the top 40 around the years of the releases along with critical reviews as to what was also influential and not just popular. And that’s quite a lot of work and it’s incomplete. How could I ever understand a Beatles record in context rather than just listen to it and say if I liked it? In a similar way, this Infiniti makes little sense of in isolation. I don’t understand the American CUV market. I don’t understand the car’s place in Nissan’s platform evolution nor its role in Infiniti’s. I can see what appears to be a moderately jacked up, 4×4, V6 sports-off-road-wagon-saloon. I can say it had a strong appeal when I saw it parked up (tailgate open – the boot is really small). Ritzy without blinging. Rather nicely made. Eye-catching. Athletic, feminine, strong. Distinctive? Yes. A lot of things called CUVs are not all that crossy at all. They are watered down off-roaders or patently just jacked up hatchbacks. Lately Land Rover’s Velar has achieved the effect this FX35 of being somewhere in between off-roader, sports, estate and hatchback. It’s a car that undermines Jaguar by its very existence. Before that car, the EX35, the mystery we see here sold as an “FX35”. I had about two minutes to look at the car and have used two hours to present this impressionistic mess. So, the little-sold and little seen and little-understood EX35 drove away after I’d chatted to the owner. Maybe I made his and his wife’s day by declaring their vehicle “beautiful”. If I want to see another one, I’ll have to go and find the vendor of the misnamed car in the images. We have one of these in our little Norman town. I think it’s an Infiniti X35, but as you say, nomenclature’s muddled. This one hardly ever moves, although it once followed me on a cross-country route, but never tried to pass the capable Kappa. I’ve walked past it at least once a week for two years, but ignore it, so don’t even know if it’s petrol or diesel. I suppose the “35” means it’s a 3.5L petrol. They have one of the worst emissions stats, in either petrol or diesel form. I expect they’re a status symbol in France, as are Jags, S-Class, Panamera etc. And the one I see is black, which looks twice as expensive as your white one. The one I saw was off-white, like English white. About the only odd thing about it was the wobbly paint line on the lower bumper. That said, it conveyed quality without bling, a character in the surfacing and how the brightwork around the sideglass was handled. A 3.5 litre engine for something this small was silly though. Sizewise it *seemed* to be about as big a Jetta estate. I suppose the car had no natural constituency, like many of the underperforming cars I champion. Still, it did everything cars mostly do and there are loads of 3.0 saloons out there – no-one looks askance at an A6 V6 which is not much more useful than this vehicle. Given Infiniti’s near invisibility as a brand in Europe, their seemingly random naming convention doesn’t help matters at all. This is how I understand it. Cars used to be G, followed by two digits, whereas crossovers were named EX, FX, JX and QX. The latter appeared to ape Lexus’s naming convention and, apparently, caused considerable confusion. Hence, about four years ago, Infiniti overhauled their naming convention so that the cars became Q followed by two digits and the crossovers became QX followed by two digits. In all cases the second digit is a zero and the higher the number, the bigger the vehicle. The revised system is far more orderly. It is still not really good though. Renaming a car from FX35 to QX50 in mid-cycle is not going to help much. If it´s any consolation I have ordered my books by height and colour and all my photos are labelled with date, place and people and are in custom-made boxes. But what about your socks Richard? I have learned more about Infiniti today than I ever knew before – invisibility is the correct description indeed. Why do they bother? Adrian, I’m surprised you need to ask: Richard’s socks are ironed, folded and arranged in colour order from darkest to lightest, left to right. Striped and patterened pairs to the front, plain colours to the back. Oh, hang on a minute, that’s my sock drawer…Richard’s remains a mystery. The sock depot is a disgrace, sad to say. The ties are quite neatly arranged though. I bought one of those things for hanging ties (I should have bought two). The shirts hang in neat way as well: white one end, floral in the middle and plain colours by the ties as the right side. The coat hangers (uniform, bought in bulk) all hang pointing inward. Jeans and chinos are another problem as is knitwear. It´s a mixed picture. All joking aside, I have a soft spot for Infiniti. If you are sad that Lancia is no more, then Infiniti offer a chance to buy a car almost nobody else has. The Q50 saloon looks an awful lot more interesting than a 3 series. It´s a lot busier than an Audi A4 but since I have no expectations about Infiniti, I can accept the baroque styling. Actually, I like it a lot. …and found out if looked a rather like an Alfa Romeo Giulia. …. but came out about two years before the Giulia (2013 versus 2015). The Giulia is now halfway through its production life, already. 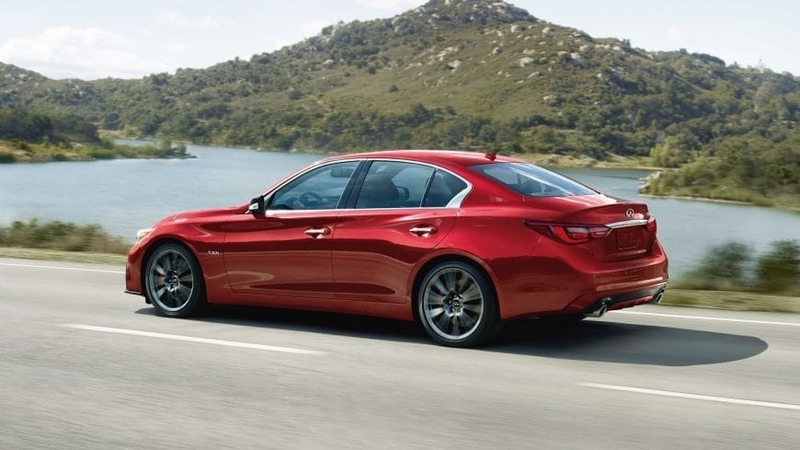 So – does anyone like the Q50? I read some reviews and none of them put me off the car. It´s not perfect yet nothing about it is awful. I’m afraid I am going to damn it with faint praise by saying it’s “fine”. Apart from that slightly quirky C-pillar treatment, it’s anonymous to the extent that it could almost be used untouched instead of those de-branded and digitally disguised cars you see in advertisements for other products. It’s telling that I couldn’t recall it at all, despite my fascination with cars from a design perspective. The EX35 morphed into the EX37 with a much better engine already used in the Q50/G37 since 2008. Completely variable valve timing and lift and no regular throttle. It has a wide powerband and revs to 7500 rpm. It’s a bit of a rumbly reassuring brute that’ll howl in an instant with a good prod of the accelerator. The 3.5 version in the EX 35 was much more civil and normal, to its detriment. In morphing, the wheelbase was lengthened quite dramatically – the back seat in the EX35 is suitable for children. Sales in North America of the EX 35 were very low due to that lack of space in a heavy car. The emergent EX37 is a more handsome and roomy car, and it became the QX50 as sales climbed. It was in fact finally the full wheelbase tall version of the G37 car, a 2009 version of which my brother owns and I have driven a few times. They look quite similar except for height. They seem very rugged and durable and well-made if my brother’s car is typical. Then in August 2017, the QX50 was cancelled and they sold ’em off at cheap prices. I tried one out, and found it with a lovely engine and adequate space. Unfortunately they were all the entry level spec or a little better and missing quite a few touches, so I passed. North South V6 AWD with a very nice drive system, since the rawest model was just RWD. They do have a fine presence and character but they are a little truckish with a bit of an abrupt ride on some bumps. Several months later in late 2017, Infiniti introduced their new QX50, a transverse-engined buggy of no particular merit beyond the Variable Compression Ratio 2.0t engine. Other than that, and claims for super fuel economy are reportedly not met, it is now a rather anonymous crossover, slightly larger than average and has no attraction to me personally. Others might not agree. It’s the same with the Q50 car pictured here, in a way – the powertrain and wireless steering being outstanding or unique, but the old G37 had presence and even a bit of sober gravity while the Q50 is a modern crease-and-wrinkle special. The G37 was smooth and svelte as was the Ex37/QX50. I’ve had another look at “our” usually stationary Infiniti. It’s an FX30 (digit I’ve forgotten) S — this latter in Red. It’s a CUV, so no Hofmeister klink imitation. No clue as to fuel type, but diesels would have predominated at time of sale, which, if Daniel’s admirable clarification’s right, makes it 2015 or before. I think I’ll take the Giulia, or, better, its Stelvio incarnation — all the car I’d ever need, as Lancia never did a more modern Kappa coupé with its handy Viscodrive. These things sell well in Russia. As for the Q50, just like a Lexus IS, there’s not much to fall in love and there’s not too much to hate, too. Despite assurances last year to the contrary, and the fact that the QX30 is made here, surely RHD production must be under question? Thank you Tom. The UK market is notoriously fickle and choosy. It´s not a surprise Lancia gave up there or that a good number of European manufacturers prefer to offer reduced versions of their range in that market. Yet Mercedes-Benz (172238 in 2018) finds the UK market has an opening for the new AMG GT 4-door. Which is: a 4-door coupe version of the AMG GT coupe, based on the E-class platform but which is different from the CLS. Or something like that, I read it yesterday and forgot almost immediately. It seems an odd position where BMW (just behind – 172048) is running out of numbers (2-series coupe, vs 2-series Tourers, which are different cars), such is its range, yet Honda (52570) is down to Jazz/Civic/HRV/CRV/NSX. Those two brands, and Audi (143739), each sold more than all three of PSA’s French brands combined (135735) in the UK market!